Abby the Librarian: Book Review: Pssst! 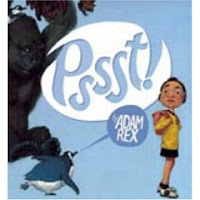 I don't generally review a lot of picture books, but I had to make an exception for Pssst! because it's one of my new storytime favorites. I have to admit that at first I was skeptical about its appeal as a readaloud. The pictures are very detailed and about half the book is illustrated in comic book form with small panels and speech bubbles. Yes, I was skeptical. But I've used it twice now with two different groups (one of which is typically a very hard sell) and I got rave reviews both times. Pssst! is about a girl who goes to the zoo. As she walks about, visiting the animals, she hears "Pssst!" (a repeated sound that the kids were eager to chime in on). Each animal that gets her attention wants her to get something for it. The gorilla wants a new tire. The penguins want colorful paint. The javelina wants trash cans. The girl reluctantly agrees to procure all this random stuff for the animals at the zoo... and there is one surprising spread that shows how the animals used all the items. When reading it aloud, I narrated the wordless bits that show the girl walking through the zoo. I also used different voices for the girl and the various animals she talked to so as to make the paneled pages clear. Like I said, the illustrations are pretty detailed and I wanted to make sure that the kids sitting in the back could keep up with the story. They didn't seem to have any problem keeping up and they were all suitably impressed when we got to the surprising spread. Although I'm recommending it for a lower elementary readaloud, I think there's much to glean from independent or one-on-one reading as well. Kids will love picking out the funny little details in the pictures (for example, the picture of the giant store where the girl gets all the items has a sign that says "50% off all things starting with T" and kids will love finding everything on the page that starts with a T). It'd be a great book for parent-child sharing because many of the little detailed jokes are obviously aimed at adults (for example, the sign for the walrus at the zoo reads: I AM THE WALRUS (koo koo kachoo)). Have fun reading this one over and over. And if the kids in your life love it, make sure you pick up some of Adam Rex's other goodies. Frankenstein Makes a Sandwich is great at Halloween or any time and The True Meaning of Smekday walked away with this year's Cybil for Elementary/Middle Grade Fantasy/Sci-Fi.